A bivy sack certainly isn't for everyone, but for those who are in the market, the Lightsabre bivy sack is about as good as they come. There are plenty of people who have negative things to say about single-person bivy shelters, but for the most part, those people are trying to compare them with the advantages of a tent. And you just can't do this. A bivy sack is much different from a camping tent, and so the pros and cons cannot be weighed in the same way. For those campers looking for a quick, light, no-nonsense shelter for aggressive mountaineering, an ultralight bivy sack like this one should be near the top of the list for consideration. But for people looking for shelters for family camping trips, it wouldn't be wise to spend money on this. An ultralight bivy sack is a tent-like shelter that encloses a person in a sleeping bag and not much more. Some models have enough space to put a medium-sized bag in the head or foot space, but most don't even afford that much room. The Black Diamond Lightsabre bivy is one of the latter--an ultralight bivy sack designed for extreme mountaineering. Unless you are a fairly short person, you won't have enough room for more than an extra set of clothes in this bivy sack. It's a specialized shelter, certainly not designed for everyone, but for those on the go who only stop for sleep, the Black Diamond Lightsabre ultralight bivy sack is one of the best. 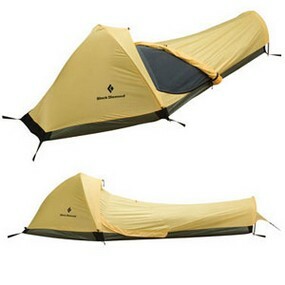 PLEASE NOTE: Unfortunately, the Black Diamond Lightsabre Bivy is no longer made. This review will remain up for historical purposes though. Black Diamond took the blueprint for the more rugged Bibler Tripod Bivy and tweaked it a bit to create this new model. What they did is find the lightest, most packable materials they could to create a feather-light version of the mighty Bibler bivy sack. Using the groundbreaking Epic fabric, they crafted an ultralight bivy sack that is far more water-resistant and breathable than most of its competitors on the shelves. Size & Weight - The Black Diamond Lightsabre bivy sack is lighter than a feather. Comfort - For an ultralight bivy shelter, this shelter is surprisingly comfy. Water-Resistant - It isn't waterproof, but you'll still be dry. Of course, those who are unused to sleeping in these one-person shelters may have a hard time adjusting. For instance, condensation unavoidable. Since the epic fabric of the bivy is so close to your body, it's really impossible to create enough air flow to prevent a little moisture. But in our research, we here at Camping Tent Reviews have found that this issue is present in just about every brand and model of bivy sack on the market. The Lightsabre bivy shelter may suffer from a little morning condensation, but not nearly as much as other shelters (like the North Face Backpacking Bivy or the Outdoor Research Highland Bivy). There are many advantages to owning a bivy sack. Ease of use, high portability, and quick shelter are the foremost benefits. And when compared to other bivies, this Black Diamond ultralight bivy sack is among the best . At just over a pound and a half, and smaller than a hardcover novel, the Lightsabre is so light and compact that it can fit into just about any compartment of your backpack. Bivy sacks are known to be fairly uncomfortable, claustrophobia-inducing shelters that work well in theory but are not actually enjoyable. However, with extraordinary head room, including a mesh vent above your face, the Lightsabre is anything but claustrophobic. Another great benefit of owning this Black Diamond bivy sack over other brands and models is the Epic fabric construction. This is still classified as water-resistant (as opposed to waterproof), but unless you are sleeping under a steady downpour with the pressure of a fire hose, don't expect any water to breach its walls. One of the biggest disadvantages of the Lightsabre is one of the biggest disadvantages of any bivy: condensation. This, as noted above, simply cannot be helped. But you can rest easier knowing that the Lightsabre is actually doing a better job at keeping the moisture out than most of its competitors. Another negative aspect of the Lightsabre bivy shelter is that it can get pretty warm in there. While this may not be bad for colder seasons, it can be something of a hassle during summer nights. With the only vent situated right above your head, there is absolutely no chance of a cross breeze in this bivy. It has also been noted that campers of a certain height (generally 6' and over) have a difficult time getting into and out of the Lightsabre bivy shelter. Not everyone has encountered this problem, but enough to make note of it. Let's not mince words here: this is one of the best ultralight bivy sacks . While there are some drawbacks to this specific model, the benefits and advantages are enough to outweigh them. If this is the kind of shelter you need, then the Black Diamond Lightsabre bivy sack is probably the model you want. Have you used the Black Diamond Lightsabre Bivy? Share your bivy sack review and let us know how it worked for you!